"Joan has a keen interest and knowledge in our natural world. Her enthusiasm and ability to involve, communicate and work with young people is a great asset of which she has given freely over the years." Born and raised in Regina, Joan has devoted her entire adult life to working in the field of outdoor and environmental education. After completing a course in outdoor education and recreation in Regina in the mid 1970’s, Joan worked for the Regina Public School Board in the Outdoor Education Department. Her work included instructing canoeing and cross-country skiing and leading field trips to study nature. While raising a family in the late 1970’s and 80’s, Joan became involved in United Church camping. She was responsible for reopening Camp McKay on Round Lake in the Qu’Appelle Valley. In 1980, she chaired the committee that hosted the Summer Meeting of the Saskatchewan Natural History Society at Camp McKay. Joan published a book on the history of Camp McKay in time for the 100th Anniversary Celebration of this historical site in 1984. The camp continues to operate each summer to this day. Joan’s involvement in the United Church Camping expanded beyond Camp McKay to the Prairie Regional level and the National Camping Advisory Board of the United Church of Canada. This position saw her criss-crossing the country from coast to coast. The 1990’s saw Joan back at the Regina Board of Education picking up where she had left off, teaching a new generation of children about the great outdoors. Joan began working as a staff member of the Eastend Fossil Research Station in the spring of 1995. At that time she was employed by the Royal Saskatchewan Museum and given the mandate of developing and delivering educational programs at the Fossil Station. 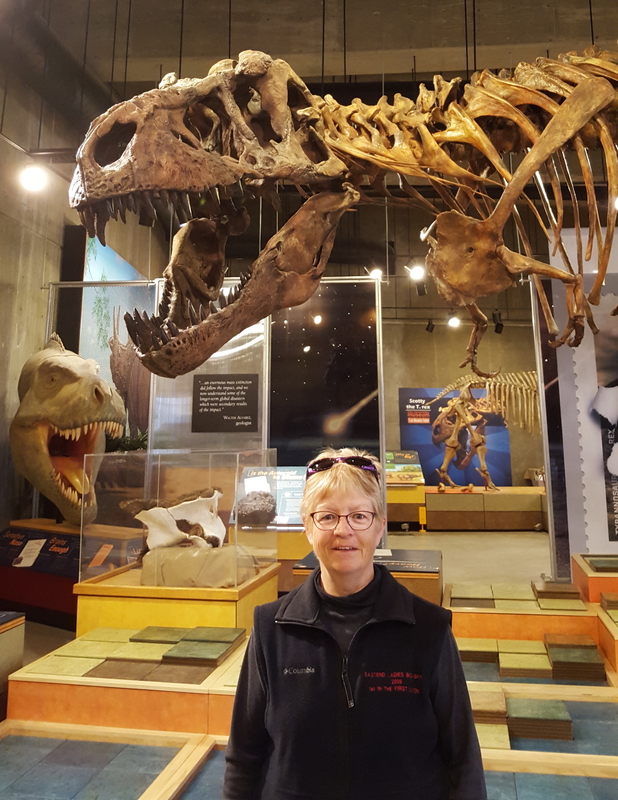 Over the next 5 years Joan worked on fossil specimens, developed educational programs, organized Ed-Geo workshops and also delivered extension programs to schools and at provincial parks. In June of 2000 the Educational position with the RSM was terminated and Joan was hired on by the T.Rex Discovery Centre as Public Programmer. In this capacity has developed a complete new package of outdoor educational programs for the public which include Paleontology, Archeology, Biology, Astronomy, Geology, and Local History. She is currently working with staff to organize programs at both the Saskatoon and Regina Children’s Festival as well as working with the Saskatoon Tribal Council to participate in a one day workshop. Joan has a great deal of respect for the outdoors and all programs and activities are designed with the protection of the natural resources as the first priority. She has been a welcomed staff addition to the T.Rex Discovery Centre. Throughout her various activities in the outdoor and environmental education field, Joan has demonstrated a keen interest and knowledge in our natural world. Her enthusiasm and ability to involve, communicate and work with young people is a great asset of which she has given freely over the years. We proudly recognize Joan for her many years of outstanding and dedicated work in a variety of areas in the outdoor and environmental education field. Dodd, L. & Radchnko, M. Joan Hodgins Melanson Award Citation, SOEEA, 2001.